On February 22 Gabrielle (Elvira's sister) was super kind and took care of Sofie while Elvira and I went up to the Organ Pipes on Mt. 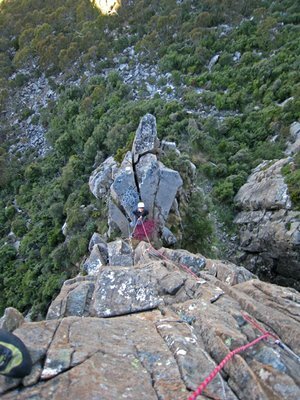 Wellington to climb another multipitch route. We decided to climb another moderate 3-star route and chose Moonraker (16, 78 m) on the Step Tier. Moonraker (16, 78 m). The route is marked with a red line. Unfortunately, we made a mistake on the approach and thus ended up bush-whacking for an hour until we finally found the correct start of the route. 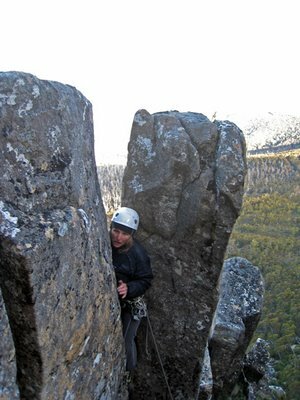 I then started climbing a crack for 2 meters and then traversed right on dodgy rock to reach a larger crack which continued past a big cave to the 'Step' of the Tier where I set up the first belay. 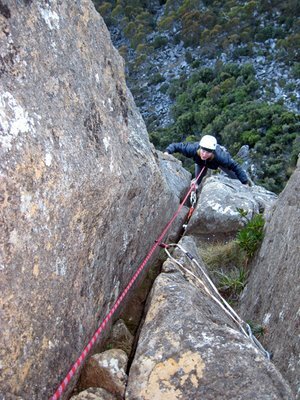 The crux on this pitch was to get out of the cave halfway up where I had to choose between climbing the now overhanging crack or traverse out to a thin face on the right. Sucking at climbing overhangs I chose the latter option. Looking back at Elvira at the base of the climb and the traverse on dodgy loose rock. Elvira climbing the upper part of the large crack on the first pitch. The second pitch climbed the left-hand arête of the Step Tier. It turned out to be quite a hard pitch to onsight considering the moderate grade. 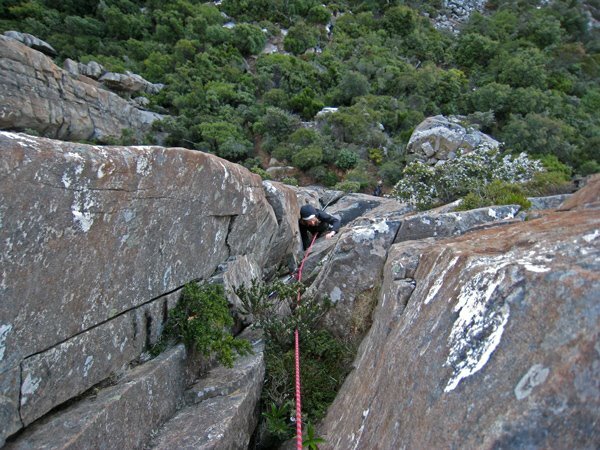 The crux was the route finding as I constantly had to go left and right to search for the path of least resistance. 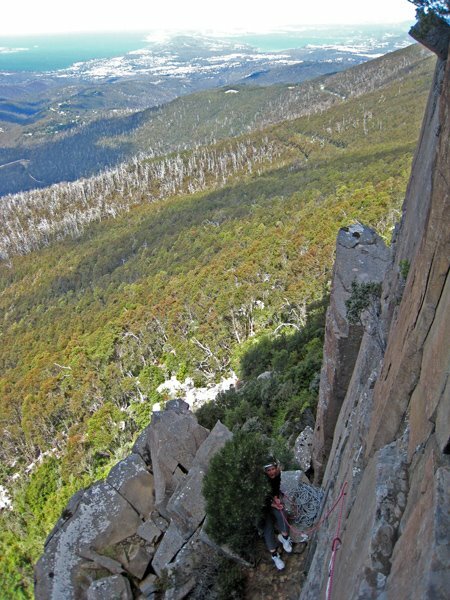 Like Fiddlestick the airiness of the upper pitch (looking down at Hobart 1000 m below) and the questionable quality of the rock (dolerite just looks and feels like a lot of bricks put on top of each other!) added to the alpine atmosphere of the route. Looking back at Elvira at the first belay on the top of the 'Step' of the Tier. Elvira topping out on the second pitch. 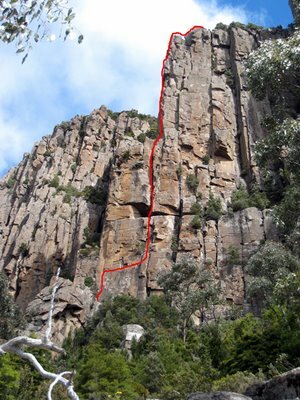 According to the guidebook the third pitch was only 5 meters long, so mentally I had already finished the route when I got to the top of the second pitch - WRONG! These 5 meters was a chimney between a short rock tower and the main rock with the rappel anchor. It turned out to be awkward to get into the chimney and even worse to climb it. 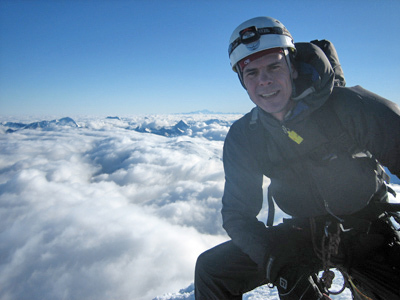 The chimney was as wide as my climbing shoes which prevented me from bridging the gap with my feet - and not wide enough to allow me to bend my knees to chimney up by having a foot on each side of the chimney. Having a backpack on certainly didn't make it any easier either and eventually I got myself so stuck in the chimney that I could hardly breathe. I solved the problem by finding a small crack on the right-hand side of the main rock where I managed to put in a friend without being able to see the crack. I then used the friend as a hanger for my backpack and pulled it up to the top when Elvira reached it a bit later. Elvira squeezed into the chimney of the third pitch. Elvira and Hans at the top of Moonraker - a bit relieved that the 'alpine' adventure is over! 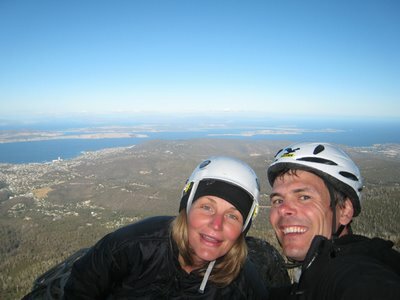 Hobart is seen in the background. We quickly rappelled down using the two fixed anchors on the side of the Tier facing Hobart. On a ledge on the backside of the Tier below the second belay I noticed two sling anchors around questionable rock. It was evident that previous parties had bailed the route to avoid the last chimney. In a way I do not blame them, although I would rather climb the chimney than rappel in the rocks they had chosen as anchors! P.S. Australian grade 16 corresponds to French grade 5+ and US grade 5.8.